Bilirubin is a yellowish pigment formed in the liver by the breakdown of red blood cells. High levels of bilirubin can lead to jaundice, which is characterized by yellowing of the skin and eyes. Mild jaundice is a common condition in newborns because all babies go through a period of rapid red blood cell breakdown after birth. Under these normal circumstances, mild jaundice typically disappears on its own, leaving no lasting effects. However, for some babies jaundice becomes severe, a condition known as hyperbilirubinemia. There are several reasons this might happen, such as being born prematurely or having certain medical conditions. If not treated, severe jaundice can cause a type of permanent brain damage called kernicterus. Fortunately, this is rare: As long as hyperbilirubinemia is diagnosed and treated right away, this potentially devastating complication can be avoided. When a newborn has jaundice, the condition is hard to miss: As the pigment circulates throughout the bloodstream the skin and whites of the eyes take on a yellow tint. The color sometimes begins on the face and then travels downward, to the chest, belly, legs, and soles of the feet. Most babies develop some degree of jaundice within two to four days of birth. This condition, known as physiological jaundice, usually resolves within a couple of weeks. When jaundice is severe, however, an infant may develop other symptoms. When bilirubin levels become high enough to bring on these symptoms, a baby is at risk of developing a type of permanent brain damage called kernicterus. For healthy, full-term babies, kernicterus rarely occurs at bilirubin levels less than about 35 mg/dL. For premature babies, kernicterus can occur at lower levels. It is still rare at levels less than 20 mg/dL. For all newborns, bilirubin levels are somewhat elevated during the first few days of life. Many hospitals check total bilirubin levels on all babies at about 24 hours after birth, often using a probe that can estimate the levels simply by touching the skin. If a new baby's bilirubin level is high, then blood tests are performed. Severe jaundice is treated with phototherapy. 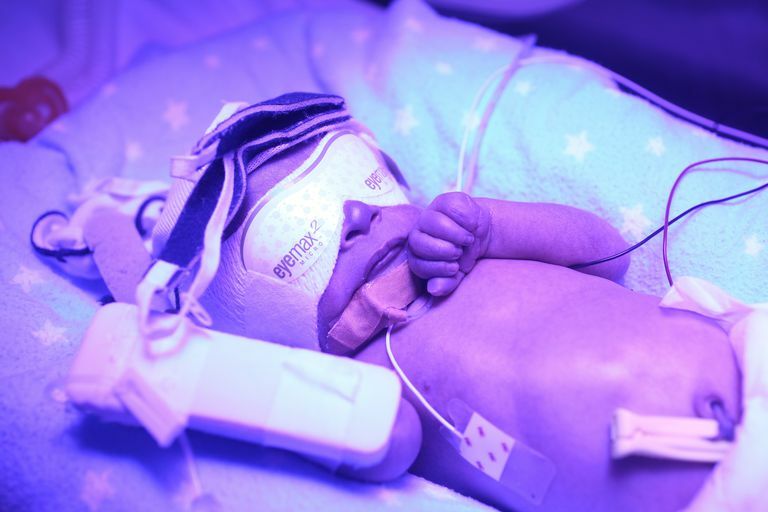 The baby is placed underneath special blue lights—bili lights—in a warm, enclosed bed wearing only a diaper and special eye shades. He's turned over often so that the lights can reach both sides of his body. It usually takes only a day or two of phototherapy in the hospital to bring bilirubin levels down to normal. During that time frequent feeding—up to 12 times a day—is encouraged: With each bowel movement, more bilirubin is removed from the baby's system. In rare cases, a baby may receive extra fluids intravenously. In the most severe cases of jaundice, an exchange transfusion is required as well. In this procedure, the baby's blood is replaced with fresh blood. Giving intravenous immunoglobulin to babies who have severe jaundice may also be effective in reducing bilirubin levels. American Academy of Pediatrics Subcommittee on Hyperbilirubinemia. Clinical Practice Guideline. Management of Hyperbilirubinemia in the Newborn Infant 35 or More Weeks of Gestation. Feb 15, 2017. Janngaard, KA, Curtis, H, Goldbloom, RB. Estimation of Bilirubin Using Bilichek™, a Transcutaneous Bilirubin Measurement Device: Effects of Gestational Age and Use of Phototherapy. Paediatr Child Health. Feb 20016;11(2):79-83. PMCID: PMC2435334. MedlinePlus. Newborn Jaundice. Feb 19, 2018.